A large museum in Moscow, Russia, celebrating the military history of the Soviet Union, and to a lesser extent the subsequent military of the Russian Federation too. It features a stunning collection of original artefacts – on that front it has to rank as one of the richest military museums on the planet. In terms of presentation and ideological objectivity, however, the overall impression is somewhat less unequivocally positive. Still, for any dark tourist with at least a minimum of interest in military affairs this is an absolute must-see institution. More background info: The museum originally goes back to plans devised as early as 1919, i.e. just shortly after the revolution and while the Russian Civil War was still being waged. The first incarnation, an exhibition entitled “Life of the Red Army and Navy” opened in 1920 (in what today is GUM at Red Square – see under Moscow). It was less than two years later that the museum was first moved to a new location, and again in 1927. 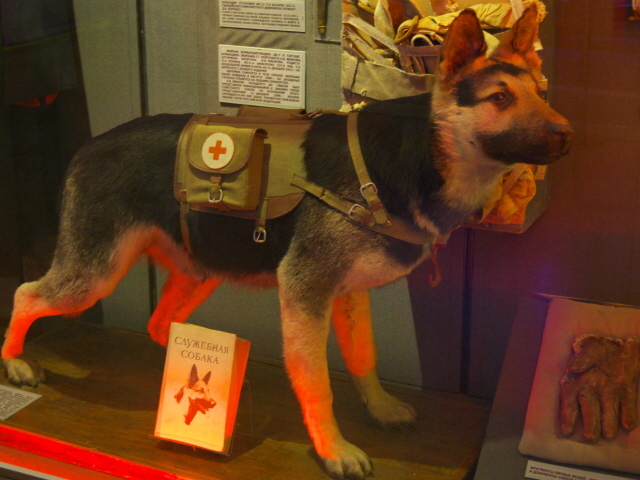 During the Great Patriotic War (WWII) the museum assumed a significant new function in education/mobilization of soldiers as well as a targeted effort to collect artefacts, photos, documents and narratives directly from front lines of the ongoing war, while at the same time the existing collection was largely moved out of Moscow to safety in Kazan. After the war, this obviously meant great changes to the museum itself, as it was vastly expanded and transformed. After Stalin's death and with the onset of de-Stalinization, another phase of transformation followed. In terms of content, the focus on the cult of personality of Stalin was removed, or at least toned down. The greatest change physically, however, was the construction of an all-new grand museum building, which opened in 1965. 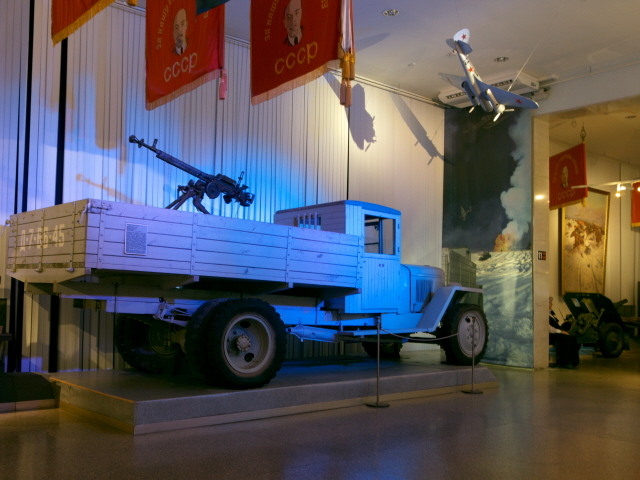 The museum collection kept expanding all through the Soviet era, including a coverage of the post-WWII conflicts up to the end of the Soviet intervention in Afghanistan in 1989. Following the collapse of the USSR and the turmoil in the wake of this momentous historical phase, the museum faced the tall order of reorganizing and reinventing itself. This not only applied to contemporary military history, but it also opened up for the first time the possibility of looking back beyond the revolution of 1917. In the 2000s, major repairs and updates of the exhibitions were undertaken. The updating seems to be constantly ongoing, as recent/contemporary conflicts such as in Syria, Chechnya and the Caucasus (see Georgia) received coverage too. 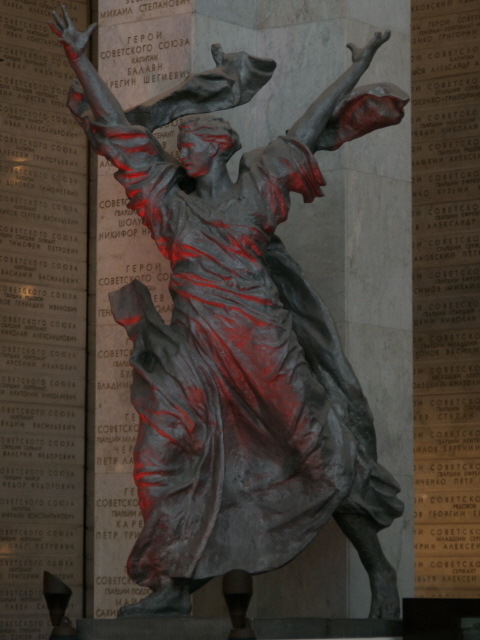 Yet while the end of the Soviet era had removed some former ideological restrictions and canonized Soviet propaganda routines from the museum's obligations, it now became part of a new narrative of contemporary developments in which it is again, within Russia's current political climate, clearly not so easy to retain an objective, apolitical view on what's happening either. What there is to see: The museum announces itself already from a distance by means of a big silver ICBM piercing the sky in front of the building. Its entrance is in addition flanked by a tank and an artillery gun of plinths, as is so typical for almost everywhere in the former Eastern Bloc. Before heading inside also take a look at the Kursk memorial in a grove of trees just to the south of the entrance. In contrast to the Kursk memorial in Serafimovskoye cemetery in St Petersburg, this is not just abstract, but depicts a submariner standing tall while a scaled-down shape of a submarine by his feet is going down. The sub is strangely bent so that it actually looks more like a breaching whale. Through/over the fence behind the Kursk monument you can also get a glimpse of the open-air part of the museum – also from the fence to the north of the museum building. It's the usual parade of big guns and tanks, but also includes yet more missiles, several planes and even boats (high and dry). I made do with seeing these parts just from the fence, but of course those who like wandering around amongst such big military hardware should go and explore it properly. The remaining text below only covers the indoor exhibition. 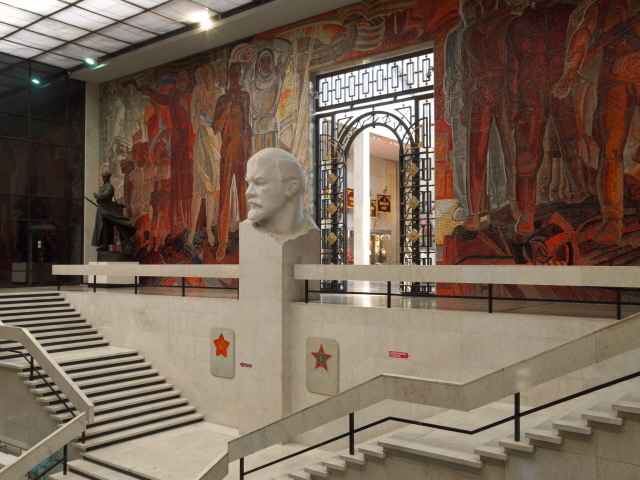 Once you step into the lofty foyer you are catapulted straight back into Soviet days, with a giant Lenin head greeting you from the top of the grand marble stairs adorned with red stars. 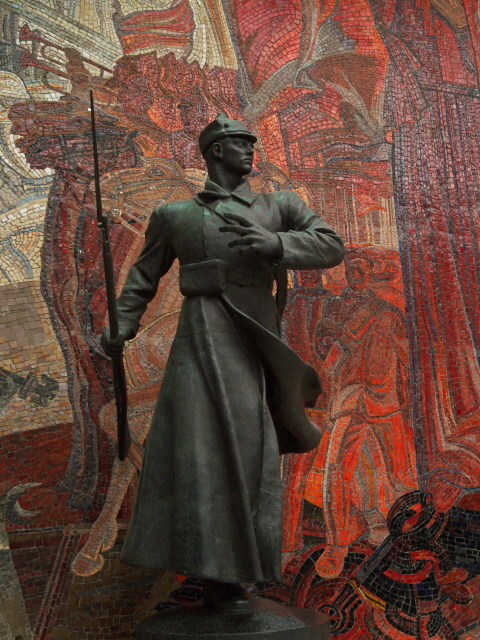 The far wall is covered from top to bottom and side to side with fantastically exaggerated socialist-realist mosaics depicting revolutionaries, soldiers and even cosmonauts. The exhibition, however, starts on the ground floor. It is mainly organized in a chronological order, beginning with some coverage of the history of the Russian Army before the 1917 revolution, including a section on World War One. There are lots of objects in display cabinets as well as life-size recreations of trenches, all drowned in rather garish colour LED lighting, which makes photography often rather difficult (I had to resort to shooting in RAW a lot so that I could sort out/correct the white balance later). The WWI section is followed by one on the Russian Civil War after the revolution, including the foreign interventions (see Mudyug “Death Island”). The grandest thing to point out here is an oversized oil painting just to the left of the doorway to hall 4. It shows a slightly too tall Lenin in a gloriously victorious pose in the foreground, while a slim young Stalin stands closely behind him – and amongst the rest of the communist gathering in the background there's even a Trotsky … somehow they must have forgotten to edit him out here. Otherwise this section is rather old school with mainly big Soviet flags and banners, glorifying statues of fighters and lots of black-and-white photos, but fewer artefacts. The exhibition continues in the north wing … and initially in a rather old-fashioned style too, with loads of photos, uniforms, weapons, medals and other assorted artefacts – all annotated in Russian only, by the way. I declined using the audio-guide you can hire from reception, and instead relied on my Russianist wife to translate for me where I deemed it essential and couldn't work it out by myself. That way I got by OK. Things got a bit more interesting in the WWII sections, or rather: those on the Great Patriotic War as the war in the Soviet Union from 1941 to 1945 is better known as here. This is by far the largest section in this museum stretching over the remainder of the ground floor and more than half of the upper floor. 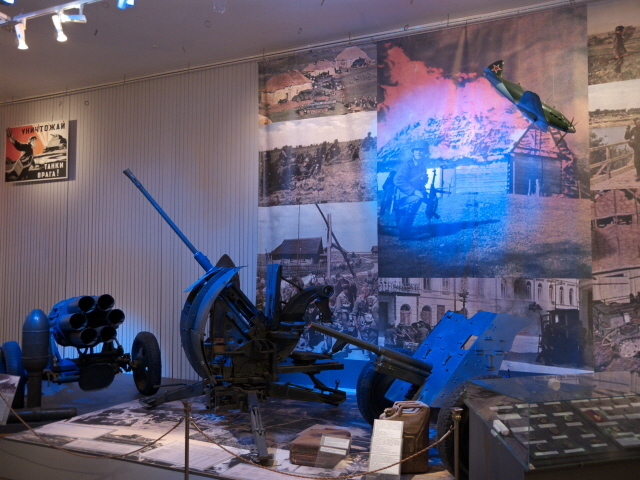 Apart from all the military developments and battles, the exhibition also covers other aspects such as the medical angle in war, but of course it's the machinery of war that is most lavishly represented amongst the exhibits, including all manner of artillery, shells, bombs, machine guns, models of tanks, Katyusha missile launchers and planes, as well as parts of real plane wrecks, and so forth. It's impossible to give an overview of all that here. 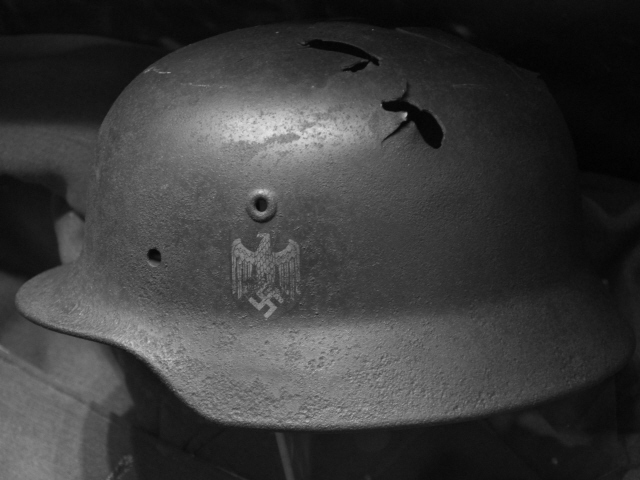 The photo gallery below instead picks out just a few remarkable individual artefacts, including some astonishing Nazi relics of types I'd never seen anywhere else before. One subsection that deserves special attention in our context, however, is that on concentration camps and the Holocaust. It's only a small section but includes, amongst the more predictable displays of striped camp inmate clothes, old shoes and a copy of Hitler's “Mein Kampf”, some rather stunning items such as a framed piece of tattooed human skin from Majdanek and a photo of a shrunken head from Buchenwald. In Germany such displays would be quite controversial these days. So it's quite remarkable to find them here. 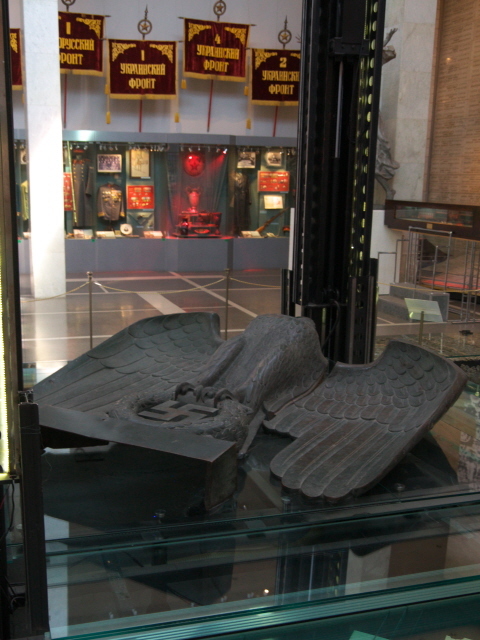 The final part of the WWII section is, naturally, devoted to the glorious victory of the Red Army. 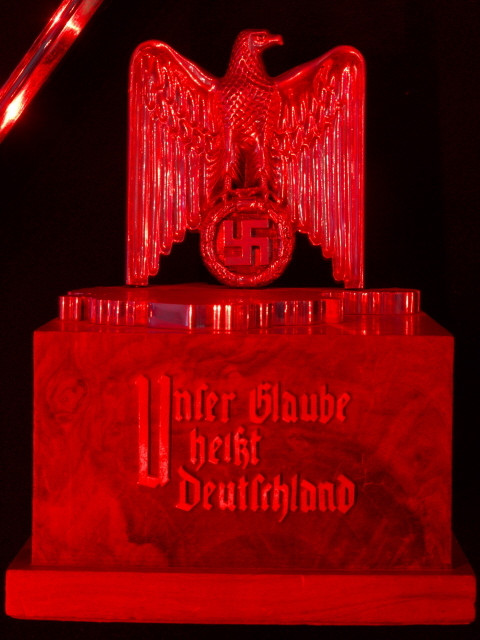 Pride of place is given to a shrine-like glass cabinet in the centre of the large domed hall containing some special Nazi trophies, such as a broken Imperial Eagle (Reichsadler) emblem and Cyrillic-graffiti-ed pieces of wall from the Reichstag, and at the top the (genuine?) flag that was so famously hung from the Reichstag at the end of the battle of Berlin. Nazi banners that during the victory parade on Red Square were trampled all over are also on display. Needless to say quite a bit of the cult of personality about Stalin survives in this hall too. What I found the most captivating part of the museum, however, was the following section about the post-war military history of the USSR, i.e. primarily the Cold War. Pride of place in this section goes to one of the most remarkable relics of the whole museum – and its from one of the most significant and media-hyped episodes of the whole era: the wreck of the American U-2 spy plane flown by CIA pilot Gary Powers who was shot down over Soviet territory in 1960, causing a major diplomatic incident (he was arrested and tried but later exchanged for the Soviet spy Rudolf Abel at Glienicke Bridge). A lot of the rest of the Cold War section naturally revolves around the threat posed by nuclear weapons. 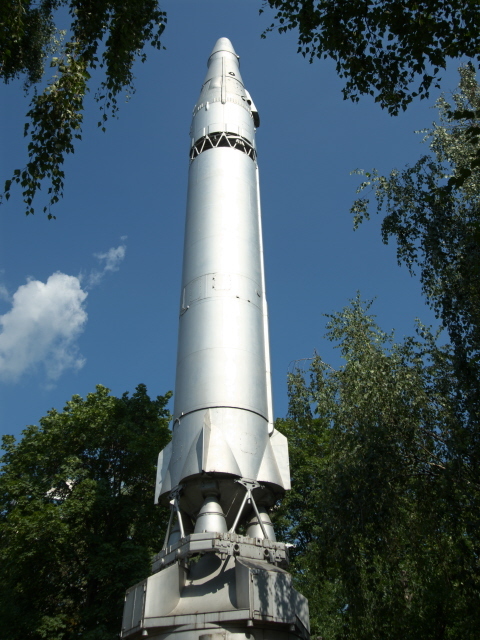 The father of the Soviet hydrogen bomb, Andrei Sakharov, is duly celebrated here (even though he later became a dissident – see Sakharov Centre), as is the biggest achievement in the Soviet nuclear weapons history, if going by size and destructive power alone: the so-called “Tsar Bomba” (cf. Kremlin, Sarov). An almost cute little scale model of this and other Soviet nuclear bombs are on display, together with all sorts of documents and photos. Furthermore there are models of missiles and underground ICBM silos, all manner of weird and mysterious looking apparatus from such installations and even a life-size base section of a mobile ICBM launcher as well as several warheads. One non-military nuclear topic is covered too, namely the fate of the “liquidators” who risked (and, in many cases, lost) their lives in the clean-up operation after the Chernobyl disaster of 1986. In addition to dramatic photos some hats and nose-and-mouth masks worn by liquidators are on display here. The aftermath of the Cold War gets some coverage too – e.g. in the form of dummies in protective clothing and images of plants dealing with the disposal of chemical and biological weapons. A rather elaborate section covers the last war fought by the Soviet Union, namely in Afghanistan, which to this day remains a heavy trauma in post-Soviet/Russian memory. A specific trauma of the post-Soviet era gets a lot of space too: the Kursk disaster of August 2000, when this nuclear submarine exploded while submerged and sank, taking all on board with her. 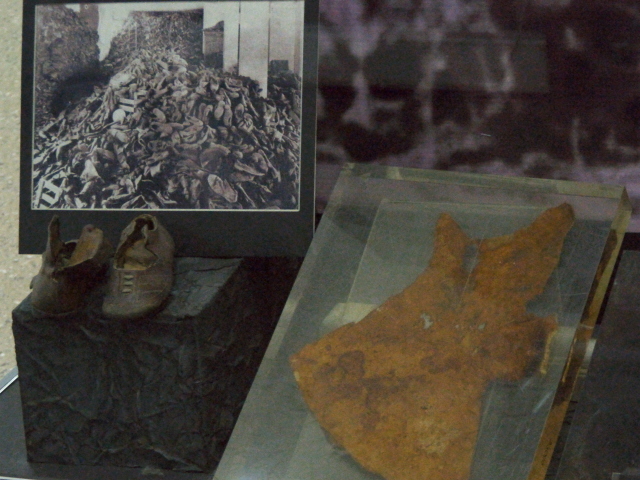 Apart from a model and a large oil painting of the submarine, there are also various artefacts and personal effects salvaged from the wreck on display here. I found this section especially moving. One piece that stands out is one of the broken windows from the conning tower of the sub (parts of this tower have been transformed into a Kursk memorial in Murmansk that I had visited in 2012, and maybe that's why it so resonated with me). What I found quite stunning too, not for its size or for what it is, but for its recentness was a piece of wreckage from the Russian Su-24 fighter plane shot down by the air force of Turkey at the border with Syria in 2015. That incident caused Russian-Turkish relations to sour for while back then (although those tensions seem to have long since been overcome). 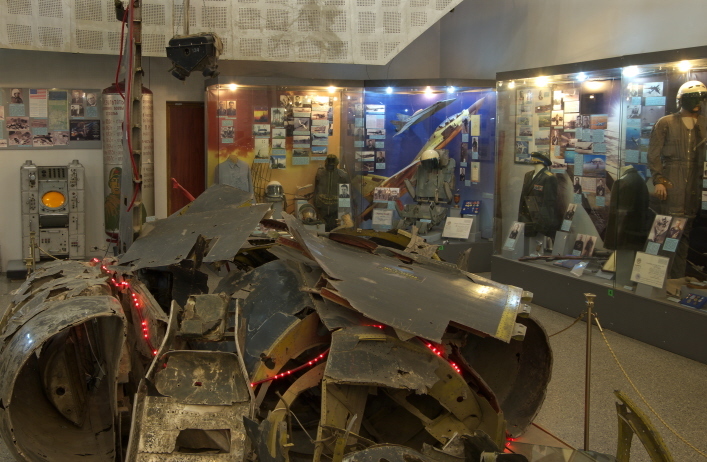 These last few items are in the final section of the permanent museum exhibition that covers the post-Soviet and current Russian military – including its modernization, but also the several military conflicts Russia has been involved in over the decades since the collapse of the USSR. All in all, however, this museum impressed me much more than I had anticipated. OK, the early sections are a bit stuffy and old school, but this is more than made up for by the surprisingly up-to-date modern section at the end of the exhibition as well as by the richness of authentic, and often unique and dramatic artefacts throughout. Worth seeing even if you're not a dedicated military history buff – but for the latter it is obviously a must-see institution! It's probably one of the world's most significant military museums (though in my view not the very best – that title I would give to the Military History Museum in Dresden!). Location: to the north of the centre of Moscow, a good two miles (3.5 km) from Red Square; address: 2, Ulitsa Sovietskoy Armii, Moscow, 129110. Access and costs: a bit out of the centre but quite easy to get to; moderately priced. Details: Getting to the museum from the centre of Moscow is easy by metro: get to one of the interchanges with Line 10 (pale green) and take this northbound to Dostoyevskaya. From there it's just a short, ca. 5 minutes' walk, past the grand Army Theatre (leaving it to your left), then cross the road and head north on Ulitsa Sovietskoy Armii. With its two tanks flanking the entrance and the big silver ICBM standing outside it's impossible to miss the museum. Opening times: Wednesdays to Sundays 10 a.m. to 5 p.m.; closed Mondays and Tuesdays. Admission: 250 RUB (students etc. 150 RUB). Audio-guide in English: 400 RUB, combination ticket (admission & audio-guide): 600 RUB. If you don't know any Russian, it's advisable to make use of these audio-guides, since all texts and labelling in the exhibition are almost 100% in Russian only. Time required: I spent about two hours in this museum. If you can read Russian and have a profound interest in all things military, then you could probably spend a lot longer in here. Otherwise rather less than two hours may well suffice. The museum combines best with either the Gulag History Museum, a ca. 15 minutes' walk south, or the new Jewish Museum, a similar distance to the north-west. You'd be hard pressed trying to do all three museums in a single day, though (and due to only partially overlapping opening times that would only be theoretically possible on certain days, like Wednesdays or Thursdays). When I went to the Armed Forces Museum I tried to combine it with the Tapan Museum at the new Armenian centre and church round the corner to the north-east. But when I got there I found the museum was closed for refurbishment. So I can't say anything about what its contents might be and whether they include any dark aspects (it's quite likely though, as there was a monument outside commemorating the Armenian genocide of 1915). Not really dark as such, but also with a Soviet military association is the huge and impressively-proportioned Army Theatre opposite Dostoyevskaya metro station that you pass en route to/from the museum. The shape of the building, its footprint, is that of a five-pointed Soviet star! Combinations with non-dark destinations: There isn't much for mainstream tourism in this part of Moscow – except perhaps for literature fans: the Dostoyevsky Apartment Museum celebrating this author's life is just to the west of the Army Theatre on (naturally!) Ulitsa Dostoyevskogo (at No. 2). Otherwise head back to the centre of the city.